My knitting has remained simple this past week. I am recovering from an entire weekend of entertaining out of town family and celebrating my daughter's wedding. Phew! I am thrilled to be back to my ever so boring life. In the photo is the gradient cowl I started with the gold striping which I am loving as it lengthens. My featherweight cardigan (not photoed) is making progress as well. Gorgeous flowers, they must be from the wedding. It's nice to have fun and celebrate together bun good to have relaxing home time too. Love the way your cowl is coming along and can't wait to see the progress with the cardigan. I've just had a quick check of your book and it sounds really interesting hope it lives up to expectations. I want to knit a cowl Exactly the yours Karen, it's beautiful. I love when one of my children recommends a book as a must read so I am going to take your son's recommendation and add it to my list to read next. Enjoy a beautiful, boring day! You must be completely exhausted. Enjoy your reading and knitting time. Luxuriate in some extra time for yourself. glad you had a good weekend....but glad that things are settling for you! Your gradient is looking great!!! :) Your knitting will get you back on even keel real soon!!! I absolutely love the colours in that cowl. Loving it more every week! Neat looking cowl. I bet you are going to have a very quiet week! That gradient is gorgeous, especially with the gold striping you chose! 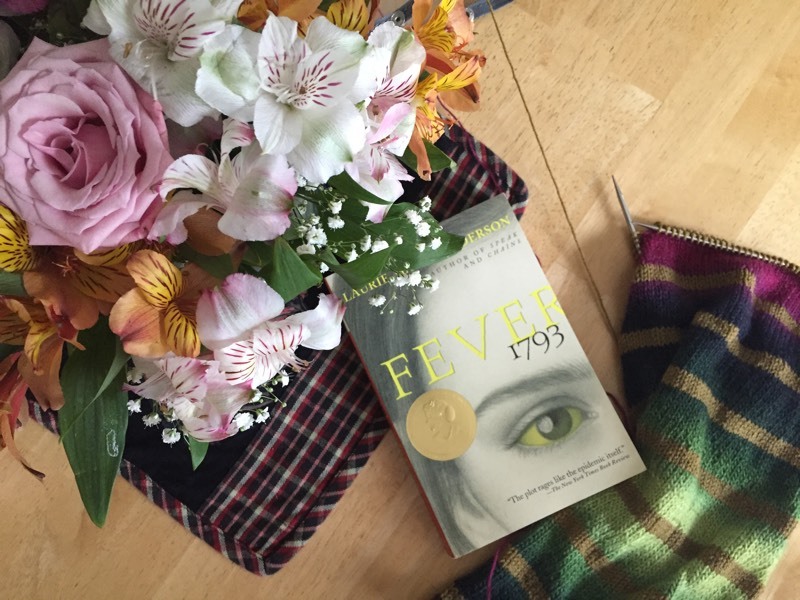 I'll look forward to your thoughts about Fever 1793. I worked in a middle school library for years but have never read that book. I can really identify with how you are enjoying being back to your boring life. That's how I always feel after a major event, even if it is a happy one like a wedding. I've put that book into my Amazon wish list and will wait for your review before I buy it. As for knitting, I've just cast on a pair of Fred and George Weasley socks. Beautiful knitting the stripes are stunning, relax and enjoy. The cowl is beautiful! Love the stripes and the gradient color changes. Love the yarn such a lovely mix of colours. The flowers are still looking beautiful, I presume they are from the wedding. the cowl is lovely. and the book looks interesting too. Can't wait to hear what you think of the book. The author also wrote "Speak," which I think is one of the best YA novels of all time. If you like "Fever," you should definitely check out "Speak." I love that gradient yarn. I still need to try a gradient project. It's on the list. Enjoy your "boring" day. Sounds absolutely lovely to me. Such a lovely photo you posted-the colors are fabulous --and your cowl? Stunning! Congratulations on the wedding! Good times and new beginnings. I love that photo, complimentary colors. It feels so cohesive. That gradient cowl is turning out just fabulous. Enjoy your recovery time. Wishing you a relaxing knit and read. Neat that your son recommended the book. I'll check it out too :-). I love this cowl! I am going to look it up this evening and maybe give it a try. It looks simple enough, only the colors will be difficult for me. :) Love your work! Congratulations on the wedding. I am sure you will recover quickly from that happy event. Your cowl is so pretty. I really love the color combinations. Your gradient cowl is just gorgeous. I love the colors you've chosen. Congratulations on your daughter's wedding. Enjoy a little down time. I loved that book! Hope you enjoy it, too. Ohhhh Boring life is great life here especially in SUMMER when I sit on my porch all the day and even slept out here last night. Im reading WHAT the Dog Saw by Malcom Gladwell and it is great. Im knitting ...well a baby blanket, a failed baby bootie and perhaps a finger puppet tonight! Oh my word, that cowl is perfection! The colors in you cowl are awesome!! Love the stripes! I am slowly knitting on my hitofude and I'm loving every minute of it! There have been a few good books for me lately, so I've actually been reading more than knitting. Right now I'm reading "a tree grows in Brooklyn", and I'm enjoying it immensely. Let us know how you love the book! :) So glad you had a lovely weekend at your daughter's wedding it sounds beautiful and can't wait to see the pictures! Also your knitting looks beautiful as always! Gosh that cowl is gorgeous! Oh that's so pretty, the gold stripes really set it off the colour changes beautifully! The gold stripes are wonderful! Very pretty project. Chase read Fever last summer! Can't wait to hear what you think of it. Knitting, not so much this week, but I'm planning a cast on party so whenever my shoulder lets me spend time with the sticks and string I'll have a project that suits the day's events. Reading, the book pile is huge, I need to get a grip! The gradient is stunning - I saw it and thought the same on Instagram! Hope the wedding went really well, can't wait to see some pics! I love gradient yarn but am never sure what to do with it. Let us know what you think of the book. Oh that cowl is amazing. The colors are gorgeous.